We are pleased to announce that we have an Alcohol Health Care Worker called Tamara Paul. Patients can refer themselves directly if they wish. Simply ring or email Tamara herself or ask a person on reception at Ashcroft to book you in with her. Tamara is happy to see patients who are social drinkers, dependent drinkers, binge drinkers and ex-drinkers. She runs friendly non-judgemental clinics at Ashcroft Surgery every Tuesday from 9-1130 am. Ashcroft Surgery’s number is 01274 612 279. What the limits per day? Men and women are advised not to drink more than 14 units of alcohol a week or 2 units per day. By a medium glass we mean 175 ml per glass. 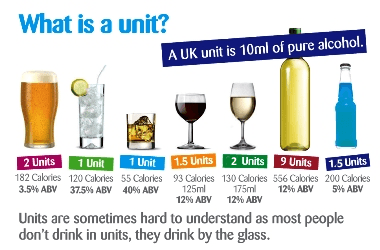 You may have seen or read that 1 glass of wine is 1 unit – BUT that is only for a small glass of wine (125ml) – which is NOT the amount most people drink! They drink a medium glass. Each bottle is 1.5 units. You can actually have about 1 and one-third of a bottle a day BUT it’s difficulty to drink just one-third of a bottle, so we’ve rounded it up to 1 bottle per day. How many units in these? Regularly drinking more than this can increase the risk to your health. http://www.drinkaware.co.uk/ – great for checking the facts, knowing your limits etc.